"The tuning fork sessions are a wonderfully stress relieving, calming and relaxing process. Since receiving this healing practice my digestion hasn't been better! Thank you Susan, for your work!!!" Sessions run 60 to 90 minutes, depending on the type of session you are requesting. We start out with some simple paperwork and discussion of emotional and physical issues that are “up” for you at the time. Given the benefits that can occur from toning, for those who are willing Susan starts her sessions with several repetitions of toning to a frequency selected by the client. The sound toned can either be "Om" or a vowel sound related to the specific fork chosen by the client, per Jonathan Goldman's identification of sacred vowel sounds associated with the chakras. This is a brief time of empowerment that results from hearing the sound of one's voice and coming into the presence of the moment. The sessions are done with the client fully clothed on a massage table and begin with an invocation and use of the “OM” tuner to bring one’s attention inward and create an atmosphere of openness and relaxation. The type of session the client desires is performed, followed by a brief evaluation and some time to talk about any shifts that occurred during the session. 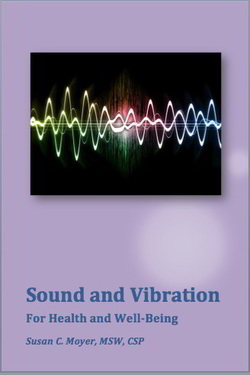 Susan’s basic tuning fork session consists of vibrating warm, flat stones on the energy centers of the client’s back, followed by the Energy Vitality Technique. The stones are vibrated with use of the body tuner forks, which have lower frequencies that allow the vibration to be felt on the body. Following this, the higher frequency forks are used through the body’s energy field, about 2 inches above the body. The client starts out lying on his/her stomach, then (like in a massage) the client will be asked to turn over onto the back to move the energy balancing from the head down to the feet. The session is completed with use of the Om fork on the lower legs and feet (helping to ground the person) and a closing affirmation. There are other techniques from the SomaEnergetics™ training, including use of the body tuners (calibrated at 1/4 the frequency of the energy forks, which allows for a deeper resonance and the ability to feel the vibration on the skin and allowing it to vibrate on the cellular level) on the body where pain or other discomfort is occurring. The body tuners may also be used on corresponding acupressure points to assist with symptom relief. There is a third-eye opening and affirmation to remove unwanted beliefs and programming in the brain. As of May, 2018 Susan ordered a new set of Solfeggio forks that are 2 octaves higher than the regular SomaEnergetics™ energy forks. She will use these for energetic clearing further out in the energy field, closer to the spiritual and mental levels. Tracing the forks about 18" above the body, she will scan for blocked energy and invite the client to participate in the use affirmations to release any noted congestion. The intention of clearing at this level will be prevention of issues manifesting in the physical body. These sessions will be longer and may be adjusted as Susan gets accustomed to working with the new frequencies. As in Eupsychia work, it is important to realize that this work with the energetic fields can be deeply relaxing and can put the client in an “altered” state. Caution is always recommended for those driving home from the session. Susan will encourage extra grounding time for those who elect to experience sessions with the higher-frequency Solfeggio forks.